Update: Phototools is fully integrated into Firestorm. Not long after joining Second Life, William Weaver, known in-world as Paperwork Resident, became interested in both SL photography and machinima. While he quickly realised the viewer has a huge capability for making both, he found that even in a TPV like Firestorm, many of the controls remain spread across multiple floaters and tabs and buried within the debug settings, making it hard to use the viewer to its fullest potential for in-world picture production without a lot of frustrating shuffling of floaters and tabs. His solution was to develop Phototools, a menu system for Firestorm that pulls together all the various settings and options within the viewer that a photographer or machinima maker is liable to need during a shoot. With Phototools, it is possible to quickly and relatively easily set-up the viewer to produce stunning visual images in a one-stop pass using a dedicated floater; allowing some stunning results to be had without the need for any post-processing through Photoshop or similar tools. Phototools has been around now for a while, available from Williams, blog, Paperwork Shows, and has been gaining popularity among Firestorm users. However, William has been working on preparing it for full integration into the viewer, and as a part of this work, he has made a number of changes to it which have just been released as version 0.94. Essentially, Phototools replaces several of Firestorm’s default floaters with updated versions. In the original release, these included a replacement camera floater, which presented a wealth of additional camera and mouse / joystick options. 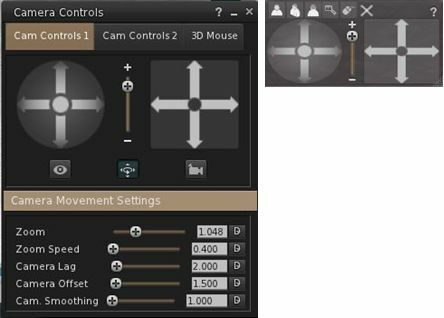 However, as it was also relatively large and cumbersome, William has reverted to using the original camera floater in the new release, with the additional controls incorporated into the main Phototools floater. For those who have been using the earlier version of Phototools, the new release includes an .XML file for the original Firestorm default camera floater. The main floater replaced by Phototools is the Firestorm Quick Preferences floater. For those who find this a very handy tool to have at your fingertips, it is not entirely lost: most of the options it contains are still available in its replacement, which I like to call the Phototools floater. This comprises six tabs: WL – for Windlight settings Light – for lighting and shadows; DoF/Glow – for depth of field and glow effects; Gen – for setting Draw Distance, terrain detail, avatar counts, etc; and Cam – for camera and mouse options. Anyone familiar with Firestorm’s Preferences tabs will immediately recognise many of the options presented within the Phototools floater; others may not be so instantly recognisable, as they’ve been pulled from the debug settings. This is where the power of Phototools lay: not in providing new options or functions, but in making those already present in the viewer a lot easier to access and use from a single reference-point with the minimum of fuss and without taking up huge amounts of screen space (and having a heavy impact on frame rates). The first tab in the floater is for Windlight settings and this includes options to open the Windlight water and sky presets floaters (which can also still be accessed via World-> Environment Editor ->Sky Presets / Water Presets). Both of these floaters have been extensively re-worked to make them much more compact and screen-friendly when compared to the default versions found in most viewers. Taken together, the Phototools floater and revised sky and water presets floaters present all the options needed to manipulate the environment, as seen through your viewer, in three panels which are compact enough not to overwhelm the screen; a major benefit when trying to set-up lighting, etc., for a specific shoot or film sequence and you need to see the impact of changes on your world-view as you adjust lighting and other effects to achieve a specific result. I recently caught up with William with a view to finding out more about Phototools and the future holds for them. I started by asking him how he got started on the road of developing them. He also noticed that a lot of people relied on external post-processing to achieve their finished results, “While I appreciate people who are good with Photoshop and after effects, I enjoy working with the limits of the viewer.” This started him thinking about how the capabilities within the viewer could be presented in a more user-friendly and accessible manner. At the same time, and while also involved in the role-play, William got to make his first SL machinima, which brought him up against additional problems. His deliberations on all of these problems led William to develop an initial menu which gave access to all the options he wanted to use via a single floater (shown on the right). While this was both lengthy and specialised, it demonstrated the idea of bringing the various options together had potential, and he was encouraged to further his experiments by a friend, who suggested a similar approach to using the viewer’s Windlight options. While working on the idea, William contacted the Firestorm team, who gave further encouragement and suggested he submit his idea in the form of a JIRA for consideration as a Firestorm feature. “So I dug deeper into the menu code and worked with a few designs, trying to make something that was both robust and easy to use,” he said. This work, coupled with feedback from the Firestorm team, led William to develop Phototools as it can be seen today; but he didn’t stop there. In order to help people get the most from the tools, he started developing a comprehensive range of tutorials and videos for those coming to Phototools for the first time, all of which are available on Paperwork Shows and also can be found on his You Tube channel, together with many of his outstanding machinima productions. The desire to make Phototools approachable is also reflected in the tool-tips associated with the floaters. These are extremely comprehensive, not only in explaining what the various options do, but also providing pointers and advisories on how to use them and what to avoid, together with relevant tips on what other tools work well alongside them. 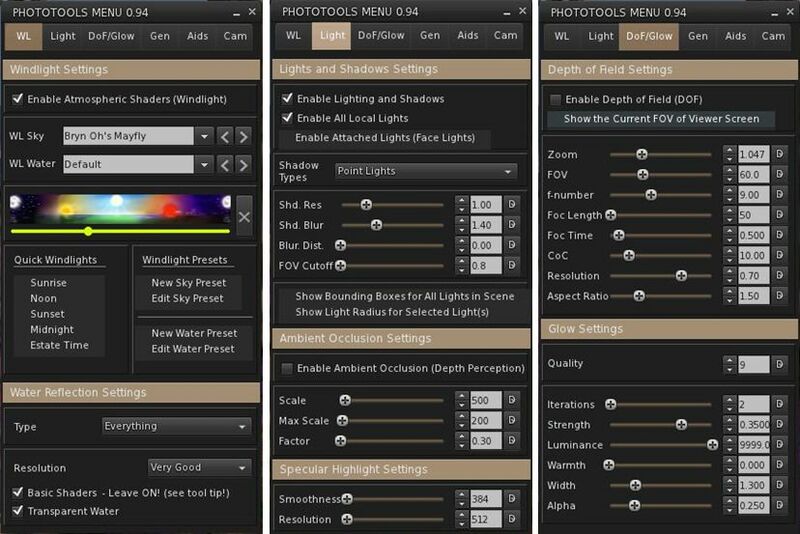 These go a long way towards making Phototools a lot less intimidating for the novice photographer. While Phototools is currently requires manual installation, this will be changing in the future. As mentioned earlier, it is currently being integrated into Firestorm, and will be available in a future official release of the viewer. This integration will see both the Phototools floater gain its own toolbar button separate to Quick Preferences, allowing users to use whichever they prefer; a wise move, given the popularity of Firestorm’s Quick Preferences. Similarly, the revised Phototools camera floater will be available as an alternative to the default camera floater, again offering users a choice of which to use; those who prefer the default camera floater can still access the additional options and mouse controls through the Cam tab on the Phototools floater. The current release of Phototools can be used – with some limitations – in other viewer flavours. The XML files for the Windlight presets menus, for example can be incorporated into any viewer and called-up using their respective button / menu option. The only item that isn’t so easy to incorporate is the Phototools floater itself. However, with the code becoming available as a TPV code contribution, it is possible the tools may well find their way into other TPVs in the future. If you’re a photographer and Firestorm user who does a lot of post-processing of images through Photoshop either because you’ve not explored the viewer’s capabilities in-depth or because you find fiddling with all the different Preferences tabs, debug options, etc., frustrating, you may want to give Phototools a try. Of course, there will always be limitations as to what can be done within the viewer; if nothing else, avatar poses alone can be a headache (arms and hair sometimes passing through body parts, etc. ), but as William’s own work demonstrates, there is an incredible amount that can be achieved before turning to Photoshop. Even if you’re not an avid photographer, you may well still find Phototools handy to have available. Phototools is available on the download page of Paperwork Shows and is available for all flavours of Firestorm (Windows, OSX and Linux). Full instructions on installing the files are included in the download, and on the blog as well. These are clear and concise, allowing Phototools to be added to any version of Firestorm with ease. Restart the viewer – the Phototools floater will now open when clicking the Quick Prefs button. However, for me (the way I see it) the whole concept is flawed, at least from a real life photographer’s point of view. That being that “original” art is lost, a-la “Instagram”. The images are (or can be) truly beautiful. But you get one shot at it and there is no going back after the fact. I considered downloading and installing Firestorm viewer and these PhotoTools, but the scenario I describe above prevents me from acting on the thought. Certainly, if you’re looking for a way to “instagram” in-world snapshots, this is definitely the way to go and there is absolutely nothing wrong with it, either. (I’m a believer that iPhone Instagrammers are photographers, too). However, if you’re a pro photographer (or aspiring one) in real life using Second Life as a means to practice or better your skills (think: photography simulator) I recommend you stick with “original art” as any SL viewer will give you and post-process the art in proper post-processing tools, such as Photoshop, Lightroom or Aperture with chosen plug-ins (like the genuine “PhotoTools” professional post-processing suite for Aperture, Lightroom and Photoshop – now called Perfect Photo Suite). Allow me to close with the simple statement that I really enjoy your SL-O-Tography (SL snapshots) – post-processed or not, Inara. Wonderful stuff. I see your point. For me, however (and given the fact that Photoshop and my brain are not on talking terms, ever), I like the idea of of Phototools because it allows me to go to a region, tweak Windlight, etc., and capture a fabulous in-world foggy morning or autumnal sunset, and get to see exactly what I’ve created in-world, not what I’ve gone on to create in software elsewhere. What’s more, once I’ve sorted the settings I want, I can pass the details over to friends. who can then recreate the same world view, which we can all enjoy together, in-world. Thanks for the feedback on my own efforts. For some reason I’m much better in RL with a video camera than I am with a stills camera (which is why I am desperate to get a computer powerful enough for me to try machinima), so I lack a lot of confidence when it comes to taking snapshots and an never happy with the results. Hardware to create Machinima with shadows and DOF is a lot less than it used to be. The video card is the most important issue starting with a GTX 460 and up. I have seen excellent Machinima with older hardware but you can be limited somewhat depending on your subject, draw distance, SIM and avatars etc. I’m not sure why the previous “photographer” would limit their “tools”. Use everything and anything is my motto if you get the desired result or at worst some interesting ideas. I don’t disagree. I’ve just found that SL video capture and my current system don’t get on very well at all, regardless of draw distance, avatars in the regions, etc. Although I keep coming back and trying things. Pingback: Luz en una habitación casi vacía. | Imagina . . .